Just a couple of random notes today --- I can't reach through the screen to tie a string on your finger, so I just wanted to remind you of a couple of things! First, one of our special sponsors is having a storewide clearance sale! Looks like everything in the store is 30% off!! Yippee!! They are doing their spring cleaning, and we are the lucky ones --- scoot over there and grab your favorite pre-cuts at great prices. Oh! I didn't tell you who it was . . . why, it's the Green Fairy! You'll have to excuse Padsworth and me; we're headed right over there! Oh, before I go, a quick reminder about a blog hop starting next week -- the Quilts of Valor challenge hop. Please be sure to visit these bloggers and help out with blocks or a quilt top for this worthy cause! 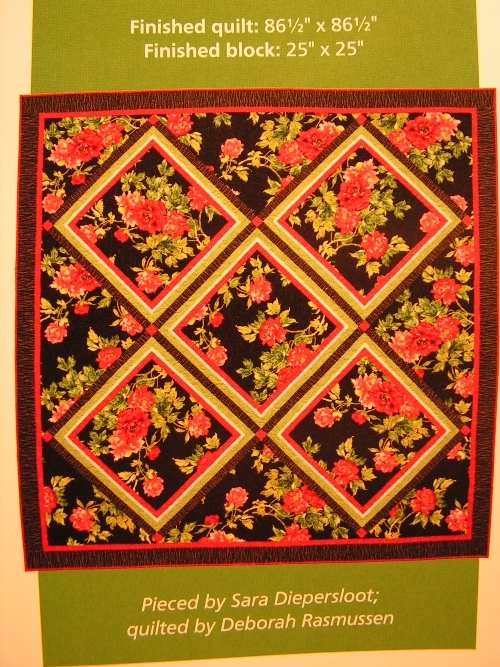 April 4: Marjorie’s Quilting Bee – will also be Blogger Spotlight for Accuquilt on April 4. Hope all of you are headed towards an awesome weekend! Martingale Books -- It's a Happening Place! 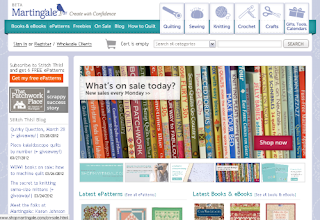 Martingale and Company is our newest sponsor at Lilypadquilting, and I’m really impressed with their brand new web site and online store. 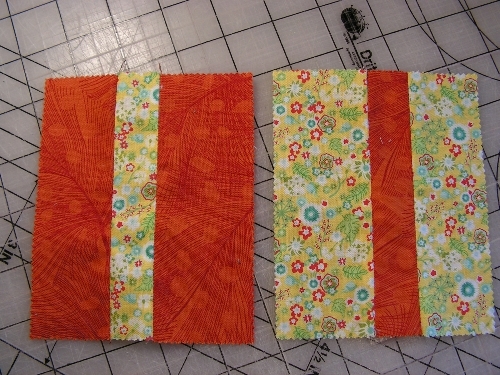 It’s called Fast and Fun First Quilts – 18 Projects for Instant Gratification. Hey, with a title like that, I know two things right off: first, I’m going to like it because I do enjoy a project that can be easily done in my lifetime. 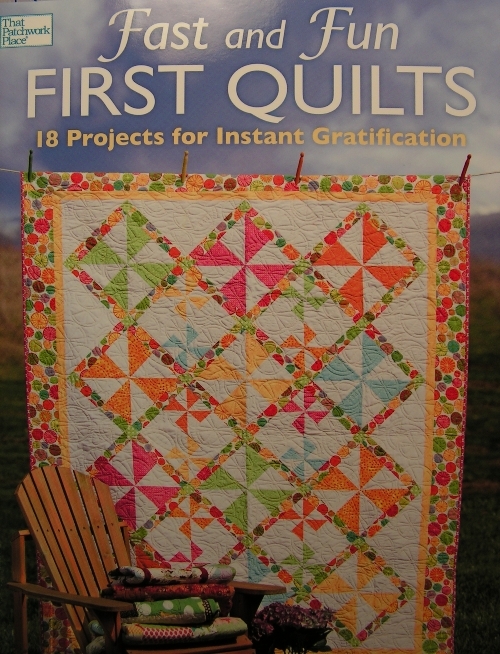 (Grin) Second, the author is a quilter who understands my needs for “instant gratification” . . . blocks that work up quickly, and that are user friendly when it comes time to put them together into a quilt! This book would be excellent for wantobes and veteran quilters alike; no one is immune to the “make it quick and easy” bug. 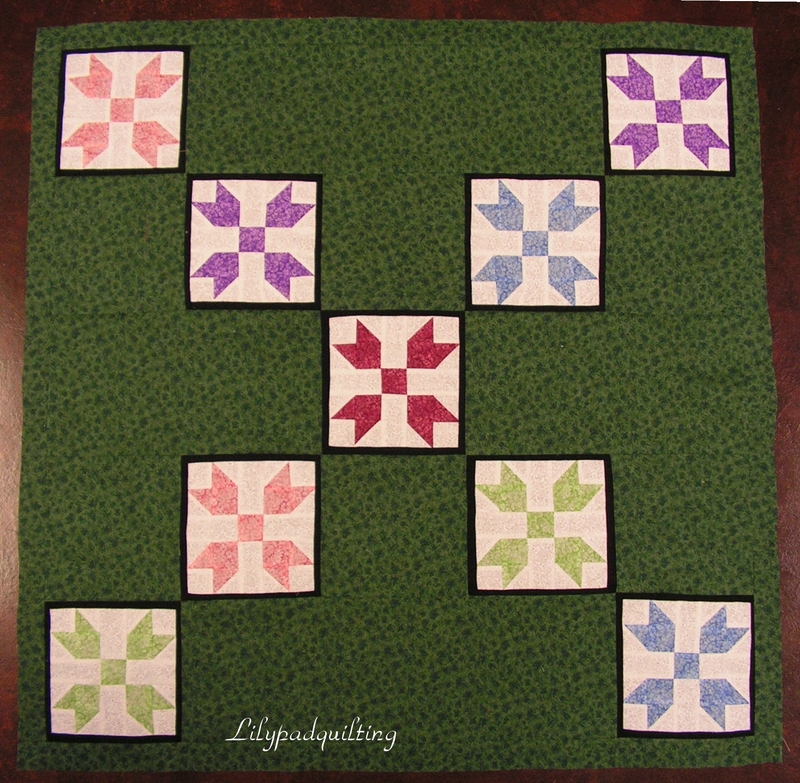 Wantobes need projects that are simple enough for their skill set, but turn out to be quilts that really look great! Veterans can always use a easy pattern for a quilt-in-a-rush situation, whether it’s for a birthday you almost forgot, or a call for quilts for a charity. 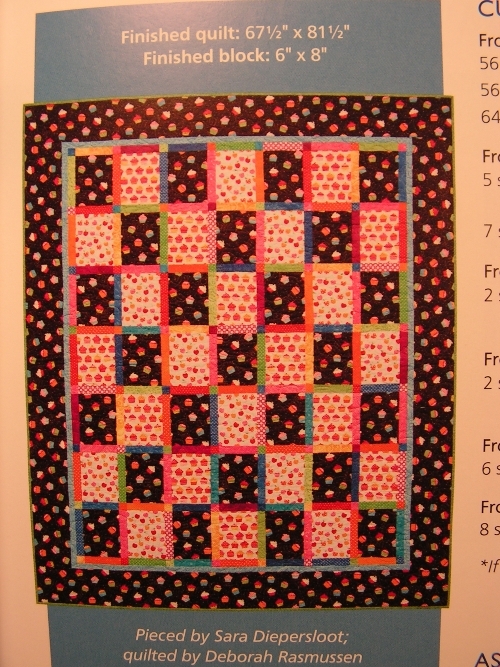 Fast and Fun First Quilts will be your go-to manual for all of the above! 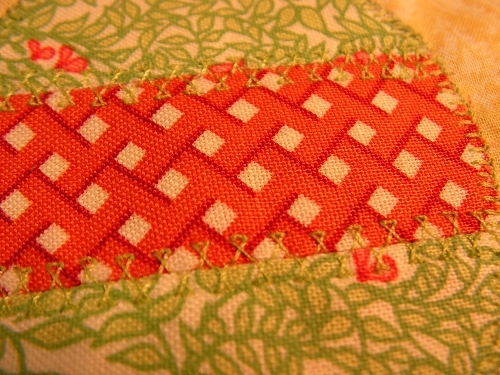 The author, Sara Deipersloot, utilized two techniques to make eighteen projects that all look different – no cookie-cutter quilts here. 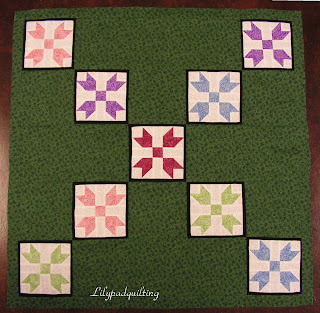 First, she shows us projects that utilize large blocks in simple settings – like this one, where pieced sashings alternate with large squares of a focus fabric. 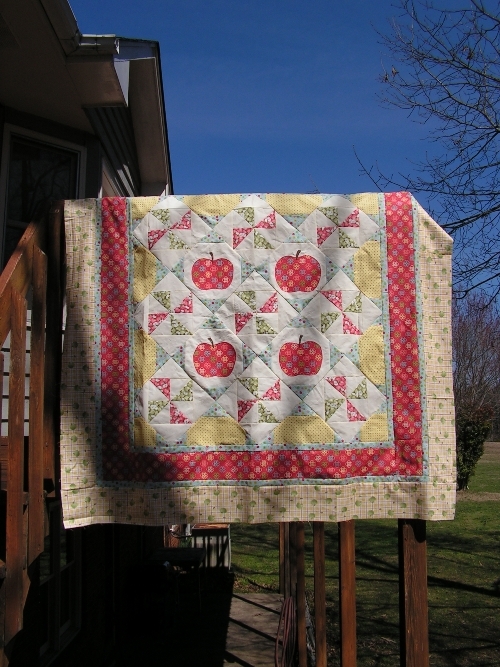 This is a great way to use two coordinating fabrics that you really like together, and with blocks that measure 6 inches by 8 inches, your quilt top is ready in no time flat! 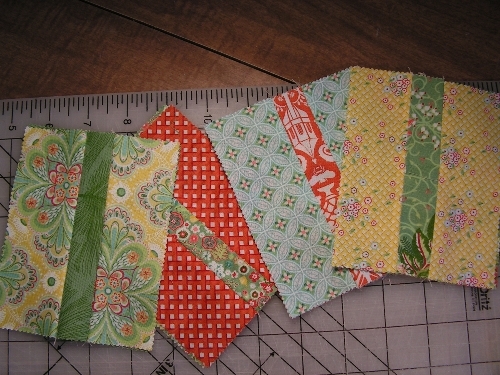 With a fabulous floral like that one, those large blocks are a super way to focus attention on your lovely fabric! The second strategy the author uses is to take a focus fabric and let it shine in a large center section, and then make pieced blocks to go all around it. Just pull some fabric colors from the center square for your pieced stars, and then add a border and you're done! I hope you'll forgive my photography skills - kinda hard to get the lighting right, hold the book open, and snap a photo, all at the same time! Martingale and Company revealed their new web site just recently, and they're celebrating their 35th birthday, too! I hope you will check out their site, and look over on the left-hand side for their blog's RSS feed button . . . you'll be in the know when they have sales (which they do, pretty often) or when they have new releases (they make a habit of doing that, too!). The blog, called "Stitch This" is wonderful -- lots of good content and (here's the magic word) giveaways!! As their site says . . . freebies, news, contests and chit-chat. One of the bloggers is Jenny, who is the author of another awesome Martingale book, called Resew --- all about giving thrift store bargains new life as new-to-you pieces of high style apparel. I've been following her personal blog, the Wild Cards, for some time now --- she's very talented, and lots of fun to know! Padsworth and I are wishing you a "hoppy" sewing day! Hoppin' Down the Bunny Trail . . .
You may remember my post about sewing along with Amanda Murphy on the Easter table topper. 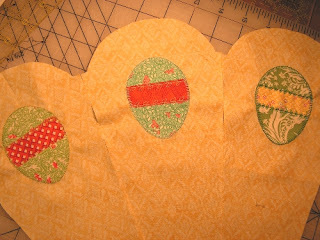 You can see the different steps to constructing this cute project here, here, and here. This has been really fun -- first of all, I'm working with Flora, by Lauren and Jessi Jung, for Moda -- what's not to love? 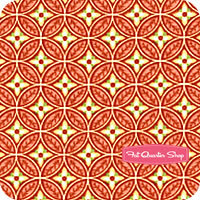 Gorgeous, sumptuous colors, evocative of Old World fabrics . . . I have cut my wedges from the Curio fabric, and I showed you the pieced charms that I cut the eggs from; now it's time to show you some of the wedges with the eggs applied! I think they're so cute! Now, I don't have a machine with all of the bells and whistles that Amanda has, but there are some decorative stitches on my lil' Brother (that I love with all my heart) and this was a good opportunity to try them out! See what you think of these --- and please be kind, OK? I did try these when I first received the machine from my loving sister, but since then, not as much. So, some of them surprised me, and the needle went in the opposite direction of where I expected! There are a few "skips" in this one, but overall, it's a keeper! I like how this one turned out! 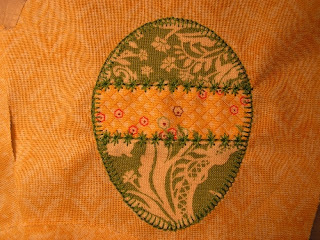 This fabric has leaves on it, and the stitch makes leaves, too! Kinda hard to see this one, but since it is subtle, it lets that fabric shine! Well, there are twelve more wedges to make, on this bottom section of the table topper . . . then it's off to my stash to choose fabrics for the petals to go on top! I'm linking up with the party over at the Shady Porch today! Check out all the fun links over there! Don't forget to GO AND VOTE!!! 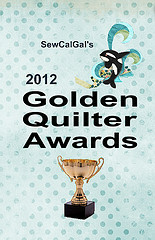 You still have time to vote in the 2012 Golden Quilter Awards! 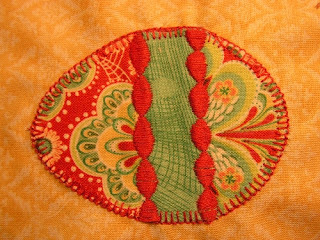 Head on over to SewCalGal's and let your voice be heard - give some recognition to those in our quilting community that have made a difference in your enjoyment of this craft. Just click on this link and you will be taken to her blog, and then you can click on the link to vote! It's that easy! There are some awesome prizes available too, so it's a win-win situation! This world of quilting that we belong to is full of wonderful people who give so much -- take a moment to vote, and let's tell those wonderful people how much we appreciate them! Need a little advice here . . . It's my table topper that I made for the Farmer's Wife in Your Life blog hop, that Sunni hosted. I'm gripped with indecision. Simply slammed with doubts. My brain is in overload mode, and that is plumb dangerous. I guess the text could be something sweet and sappy about butterflies, and spring, and things like that. 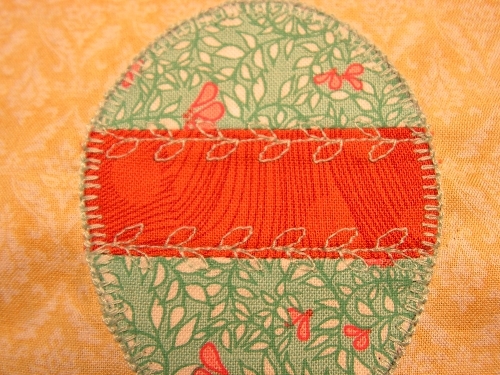 Or should I just leave it like it is --- simple, and get 'er quilted? Personally, I kinda like how the background lets me focus on those blocks, but then again . . . 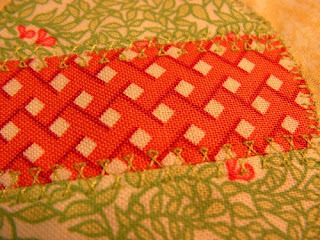 The binding will be a narrow, scrappy one, with the left-over fabrics from the blocks: pink, green, blue, lavender. Please! Help me out here, and leave a comment to tell me what you think! (Grin) I'm leaning toward the third option, but if you think I should do differently, won't ya tell me about it? Coming in April -- Blog Hops! I want to let all of you Lilypadquilters know about a blog hop that is coming in April! 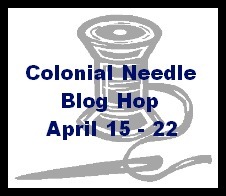 The Colonial Needle Company is sponsoring a hop the week of April 15 through 22, with lots of prizes and great products! Please feel free to grab our button from the right hand sidebar, and help us spread the word about the hop . . .
You may remember that I've mentioned Colonial Needle before -- among other great products, they offer the awesome "Pebbles" --- packages of needles that will close right up and not scratch you when you stretch your hand down into your bag of take-along stitching! Love 'em! One of the Quilts of Valor coordinators, Tink Linhart, and Marjorie Busby have worked with Accuquilt and Aurifil and are having a QOV Challenge during April and May. Our goal is to challenge as many quilters as possible to make a QOV, whether it be a set of blocks, a quilt top, or a completed quilt – and submit it by May 31 so that it can be given to an active duty service member or Veteran who has served in a war zone. We are having a blog hop April 2 – 6 to kick off this challenge and will have some great prizes for giveaways. We’d like to inspire as many quilters as possible to join us. 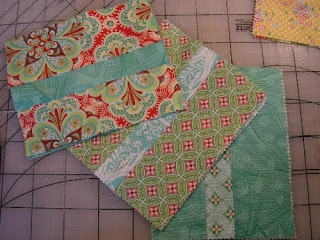 So mark your calendars for the blog hop and mark your calendars for time to make a quilt. And there will be prizes for those who complete quilts for the Challenge including Aurifil thread, fabric, and the grand prize is an Accuquilt GO!™ Baby and five dies of the winner’s choice. Sure hope that all of you will enjoy the upcoming hops! What a fun party! 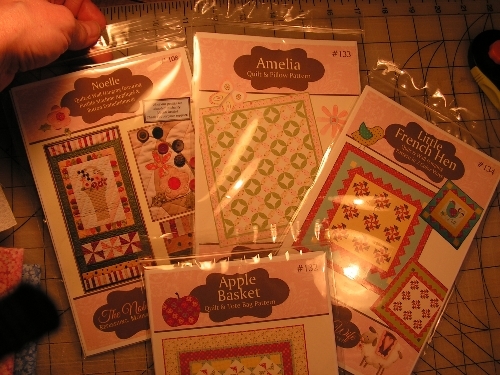 We had lots of entries in our giveaway, organized by the fabulous Michele at Quilting Gallery! We had a lot of fun answers to our question, too! I think the spring flower that had the most votes was the lovely daffodil, followed closely by our runner-up, the tulip! It's time to announce our winner . . . so here goes! 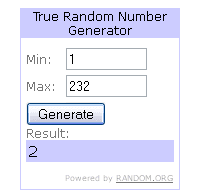 Mr. Random thought about our 274 entries and then picked . . .
And she has a lovely blog at Mountain Musings, so hop over and congratulate her if you have time! So glad that all of you stopped by, and hope to see you again soon. A little eye candy . 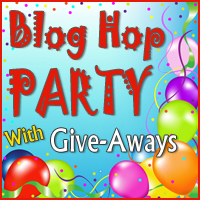 . .
Blog Hop Party-goers can click here to go to our giveaway post! I thought I would show you some sweet pictures today, and let you take a guess at what I'm doing. Betcha can't guess what I'm gonna do with them!! Hmmm, I guess I'll give you a hint. Check out this post on Amanda Murphy's blog. See what she's making? Well, I'm sewing along with her! And I'm gonna have enough of these to make two! Yay! Don't miss out on our Blog Hop giveaway! Click here to see what Padsworth is giving away, and enter to win! Today is the day! 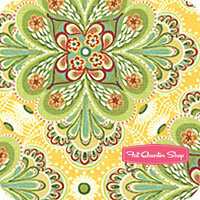 We are announcing our winners in the Jacquelynne Steves' fabric, patterns and notecards giveaway! I'd like to send a big Lilypadquilting thank you to Jacquelynne, for her generous giveaway. I loved working with her Apple Basket quilt pattern, and the lovely fabrics, and I hope to have another project for you soon, from the scraps I have left! Whoo hooo! Let's get right to it! 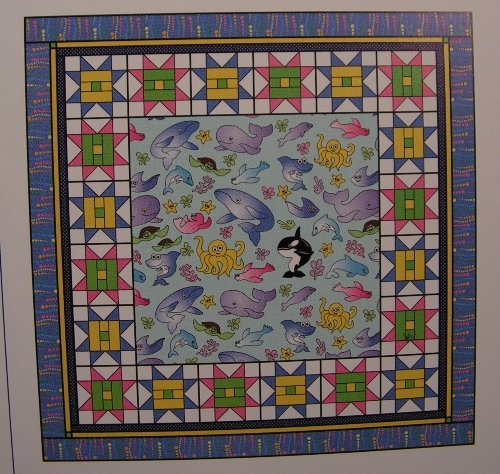 We had four of Jacquelynne's cute patterns up for grabs --- remember these? 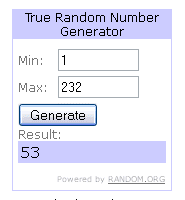 The winner of the four patterns is #53, and that's Linda!! Congratulations! I'll be emailing you for your shipping info, Linda! 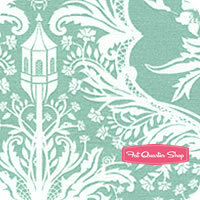 Now, we had three packs of Jacquelynne's lovely notecards up for grabs . . . these are just so pretty! 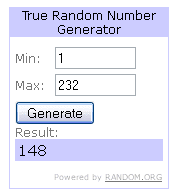 Our next lucky winner was Gill! 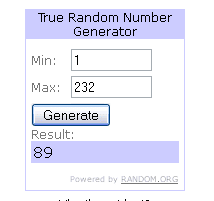 And our third winner of a pack of notecards was Margaret! Now I think we need a drumroll! The winner of our grand prize . . . a panel and fabrics . . . why, it's Connie! I can't wait to see what Connie makes from her prize package! I'll be emailing all of you to get your shipping info, and Padsworth will help me package up the prizes to send to you! Thank you to all of you who entered --- I wish I could give something to all of you! I think we have the best followers in all of blogdom, right here at Lilypadquilting! Please note: This giveaway is now closed, but thank you for your interest! Padsworth is so excited to be participating . . . he asked if he could have his picture in this post, so here you go, little buddy! It's time to party!! 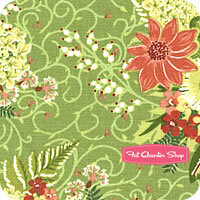 It's the Blog Hop Party with Giveaways, organized by Michelle, at the fabulous Quilting Gallery! Starting tomorrow, (or perhaps late tonight) you can click here to get the list all of the blogs to travel to, and hop to your heart's content! 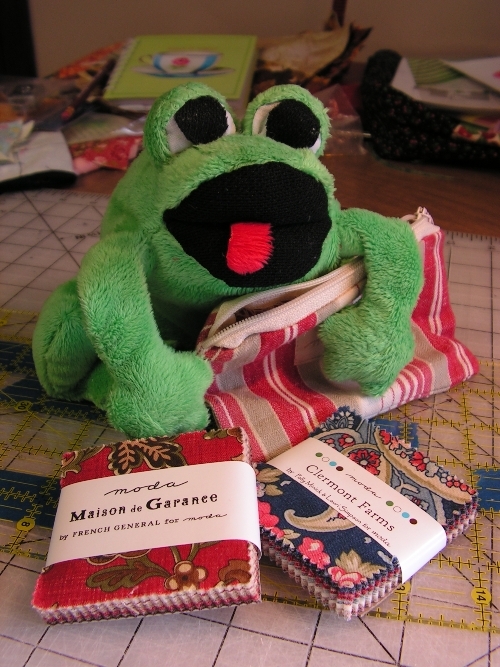 Bloggers who are part of this hop are hosting giveaways, and we are no exception --- if you look closely at what Padsworth is holding in his little green hands, you will see a cute Moda zipper pouch, and two mini-charm packs. One is Clermont Farms, by Polly Minick and Lauri Simpson for Moda, and the other is Maison de Garance, by French General for Moda. Padsworth does have great taste. Here he is after I tried to get him to let go of these so I could write this post . . . He loosened his grip a little. Not. 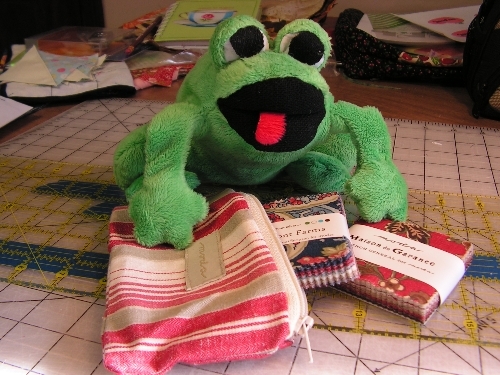 Never fear, he loves our followers, and when we pick a winner, he will be hopping for joy and help me package them to ship out to the lucky quilter! How can you win? You have to enter first. Duh. (Grin) Leave us a comment and tell us this: if you were a spring flower, which one would you be? Easy Peasy! And yes, we will ship internationally! Then, hop over to the Quilting Gallery and check out all the other blogs, too! "Farmer's Wife in Your Life" Bloghop - My Turn!! You can tell it's been raining . . . Hop on over to SewBittersweet Designs! Padsworth picks the thread . . .